A Pennsylvania cop killer on death row wants the state Supreme Court to toss out his 2017 conviction. Attorneys for 35-year-old Eric Frein will argue Thursday investigators in Pike County violated his right to remain silent the night he was captured for murdering one state officer, Cpl. Bryon Dickson, and seriously wounding another, Trooper Alex Douglass, nearly four years ago. Frein led state and federal law enforcement on a 48-day manhunt through the Pocono Mountains after gunning down Dickson and Douglass during a shift change at the Blooming Grove barracks on Sept. 12, 2014. He was identified as a suspect early-on in the case after a neighbor found his vehicle abandoned in a drainage pond near the shooting, according to the Associated Press. 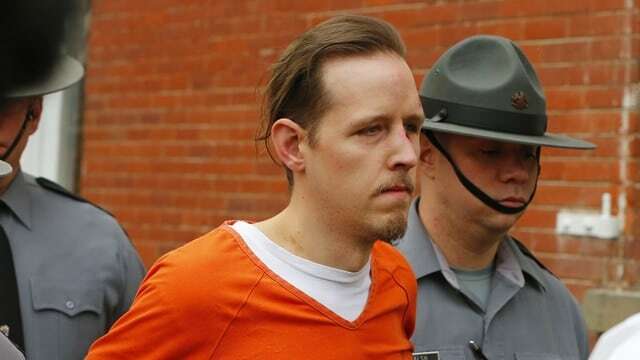 Prosecutors called Frein a terrorist and said he ambushed the troopers in hopes of starting a revolution. Frein told investigators he chose the barracks in rural Pike County, about 30 miles south of the New York border, because of the desolate, mountain landscape surrounding it. In April 2017, jurors found Frein guilty of murder, attempted murder, aggravated assault of a law enforcement officer, terrorism, possessing weapons of mass destruction, possessing an instrument of crime, recklessly endangering others and firing a gun into an occupied structure. He was sentenced to death a week later. Now Frein’s legal team said investigators refused to let his family’s defense attorney speak with Frein the night he was arrested at an abandoned air strip 30 miles from the barracks. Instead, he was interrogated for more than three hours, during which time he confessed to the killings. “The questioning at issue occurred after Mr. Frein was read his Miranda warnings, invoked his right to silence by clearly informing the troopers that he did not want to speak about any crime and refused to sign a Miranda waiver,” his lawyers argued in a brief filed in November, according to the Associated Press. Pike County prosecutors argue Frein never asserted his right to legal representation and balked at claims that victim impact testimony allowed during the trial hurt him. Although Frein currently sits on Pennsylvania’s death row, it remains unclear if he will ever face execution. Gov. Tom Wolf’s administration ordered executions to a halt in February 2015, preferring instead to wait for the results of a Senate task force’s review of the state’s death penalty system. More than 170 people sit on death row in Pennsylvania and the state hasn’t executed a single one since 1999. Since the U.S. Supreme Court restored the death penalty four decades ago, Pennsylvania carried out only three executions.